Keep L.A. Moving pushed against the Mar Vista Venice Boulevard road diet, which remained in place as data showed safety gains. Photo by Joe Linton/Streetsblog L.A.
For those of us living near the Great Streets/Vision Zero pilot program in West Los Angeles, every day brings new developments in the back-and-forth between advocates for safe streets and advocates for car commuters frustrated by delay. The road diet turned a six-lane road with a bike lane and car parking into a two-lane road with a parking-protected bike lane. The pilot project is set to run for one year, with reports coming in every three months. Following a raucous Mar Vista Neighborhood Council Meeting in June, some of the pressure that has been on Councilmember Mike Bonin, his staff, and the Mayor has shifted to the local Neighborhood Councils. The Mar Vista Community Council will meet next Tuesday to hear two motions on the road diet, one calling for its end and another calling for all of the city’s data to be shared publicly with the NCs and the general public. The Mar Vista Community Council will be hearing both motions on July 11 at 6:30 p.m. in the Mar Vista Recreation Center. Last night witnessed another drama when nearly four dozen residents and road users packed a committee meeting of the Venice Neighborhood Council, which heard testimony that was split between those in favor of the diet and those opposed. The Mar Vista Council has a long history of support for the project and has held dozens of meetings to gather input from the community. The Venice NC does not have the same history and was widely expected to oppose the project based on an overwhelmingly negative response on social media. In the end, the committee did not pass a motion to oppose the diet but instead moved an alternate motion similar to the one that will be heard by the MVCC next week calling for better sharing of data. 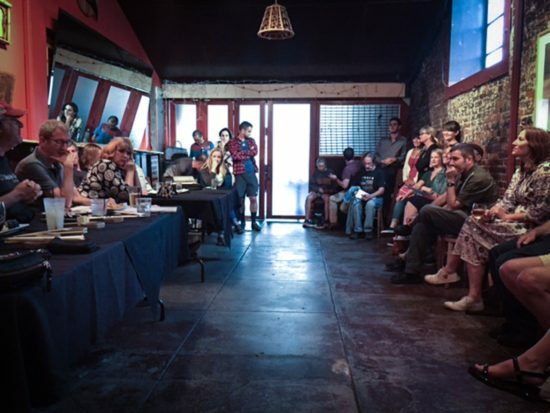 The Venice Neighborhood Council Parking and Transportation Committee met at Canal Club in Venice on Wednesday night and most of the evening was spent discussing the Great Streets project in Mar Vista. About forty people attended, with approximately fifteen residents of Venice taking part. Of the fifteen Venice residents, at least seven turned out in support of the changes in Mar Vista, in addition to several folks outside the area from various nonprofits focused on pedestrian concerns. The rest were from Mar Vista, with some from the Playa area. For a full write-up, visit Biking in L.A.
Last night while the Venice NC was meeting, the Argonaut published a pair of opinion pieces written by residents that attacked and defended the road diet. The first was written by a trio of authors from Mar Vista, Venice, and Playa Vista opposed to the road diets in Venice and Vista Del Mar. The op/ed is aggressive, citing many negative effects from the early stages of the road diet rollout, with a dash of vitriol for Bonin. The second was written by…well…it was written by me. Following the negative experiences Board Members have had in meetings and online forums, my piece is literally An Appeal for Civil Discourse. I’ve been a member of the Neighborhood Council for just under a year, and I’ve been surprised by the vitriol and anger over this project. It far exceeds what I’ve seen with other controversial proposals, including large housing and mixed-us projects. But there’s five more days until the Mar Vista Neighborhood Council meeting next week. As Westside residents are learning, a lot can happen in this debate over five days. This is inaccurate. Venice is now a four-lane road (two lanes in either direction). Can I see a diagram? This makes no sense to me. Just to be clear, my objection is changing Culver Blvd & Vista del Mar to two lane roads. I just went through there at lunchtime recently and what was previously a 2-min drive was a 20-minute stop-and-go from Vista del Mar to the stretch before Culver/Lincoln turn-off. It was ridiculous, absurd, frustrating and utterly inconsiderate. There’s your civil discourse. What’s ridiculous is that traffic collisions are the #1 killer of children in Los Angeles. What’s absurd is that LA has the highest number of traffic fatalities per capita in the country. What’s frustrating and inconsiderate is that you believe your lunch drive time is the most important consideration in this situation, as opposed to, say, the lives of the people who walk in that neighborhood. The slowdown along these boulevards would be a welcome speed-up on my ten-mile commute from Silverlake to Century City, which now regularly takes more than an hour. Been living in Venice/Mar Vista for 27 years and I’ve been a cyclist for 32 years. I’ve been riding (quite fast at times) down Venice Blvd all that time. While I certainly appreciate efforts to make things safer for cyclist, it’s been my experience that this current set up is far more dangerous. Cars trying to make a right and having to yield to bikes simply don’t see us. It was much safer the other way. And as a driver, the traffic it has created is ridiculous. Venice Blvd is a major route to the Expo Line. Adding more traffic time will not encourage people to take the Expo. And from what I’ve personally witnessed, the added traffic has resulted in angry drivers cutting through the residential neighborhoods to get off of Venice. Is that safer???? Cars are now parked in the middle of the street, so, as a driver exiting your car, you are even more exposed to traffic. Then you must cross a bike lane to reach the sidewalk. How do you see us mere mortals from so high up your lofty perch? You are using the lives of children to cover up arrogance and Trumpian-levels of ego. It’s disturbing. First, heavy traffic is not without risks and costs. From pollution, to increased traffic accidents, to wasted energy, to loss-of-quality of life, to lost jobs. Gridlock may keep pedestrians (mostly) safe but it’s not a cure-all. I have never killed anyone while driving, I hope that attentiveness and God’s good grace means that I never will. No one gets behind the wheel of a car intending on killing anyone. But there is only one solution to car deaths: NO CARS. Short of banning all driving, there will be deaths. Every mode of transportation, from surfing to boat to walking to skydiving to trampoline to biking suffers from death — even the deaths of children. So if your goal is to prevent every death of every child then you’re a fanatic not worth my time. If your goal is to improve safety and minimize the risks to drivers, passengers and pedestrians then we are comrades-in-arms. I fully support that effort with the caveat that (1) we acknowledge we will never eliminate deaths — people make mistakes, they’re dumb and accidents will still happen, the measuring stick must be reducing deaths and stopping easily preventable deaths and (2) reasonable efforts are made to evaluate safety within the context of efficiency, cost and the burden other communities in Los Angeles County must also accept. Why should only Playa del Ray get super-safe roads? I think favoritism of one community over another is fundamentally unfair. I think gridlock as an answer to the safety problem is fundamentally flawed. 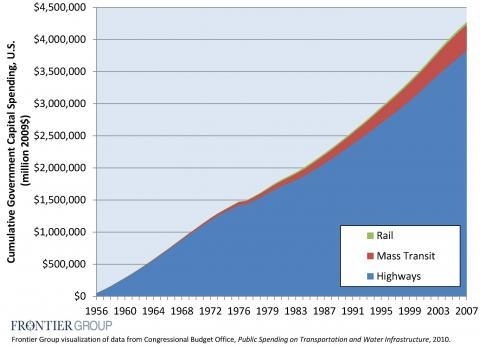 Transportation is meant to actually transport people. Using the banner “save the children” without any other consideration against those who disagree with the methods employed by the city is wrong-headed extremism. I love the photo used in the story – which I’m sure was purposefully taken when there were some bicyclists in the shot, as I rarely see more than one cyclist at a time, if that. Also, one bicyclist is on the sidewalk – illegal, btw, and counter to the whole idea of widening the bike lane. Yet, there are hundreds of people stuck in gridlock on both sides of the road during any 5 minute period: people picking up their kids, going to work, doctors appointments, etc – all so a few can enjoy a casual ride on their bike. Sure, there are a small minority of people who ride to work, but this is not the right solution. Want safer bike lanes? Install K rails or other barriers. Also, enforce traffic laws against cars AND BIKES. Its not illegal to ride a bike on the sidewalk in LA. Given that the bike racks are placed on the sidewalk, it seems logical that bikes would be there also. I walk this corridor twice a day and there is occasionally a 15-minute window where traffic is backed up. Every other time its free flowing. People exaggerate. I agree. This is not a “protected bike lane”; it’s an invisible bike lane. Cars turning right often cannot see bikes as they are hidden behind parked cars. As the cars making a right turn into driveways slow down, cyclists are going faster, neither sees each other until it’s too late not to t-bone. Bad idea that needs to be fixed. I am fully in support of safe streets for everyone, drivers, cyclists, and pedestrians. When this stretch of Venice Blvd was designated as a “Great Street”, it was clear that the primary purpose was to create a community oriented “small town downtown” featuring friendlier streets and sidewalks for all, beautification, sidewalk seating and plants, and more. What we’re seeing is changes in street configuration to support Vision Zero, the city’s plan to eliminate pedestrian and cyclist fatalities, reducing a lane and adding mid-block traffic signals for pedestrians. Nothing has been brought to the attention of the public that indicates that there have been pedestrian/cyclist accidents or fatalities that warrant these safety features. Perhaps the city would garner more support of the project if the public were made aware of the accident rate incidence in this specific area. Without such data, how will we measure improved safety? The so-called protected bike lane has in reality made bicycles and their riders invisible to cars turning right, thereby increasing the risk to riders rather than making the road safer. As drivers slow down to make right turns, especially into driveways, there are often parked cars that make it difficult to see cyclists (and for cyclists to see cars), especially at this point, when the car is moving more slowly than the cyclist. I’ve seen near t-bones of cars and bikes. It isn’t just a supposition. The mid-block pedestrian signals are a nicety, not a necessity. In fact, I’ve watched pedestrians STILL cross wherever they choose, in between the new signals and the existing intersections. Perhaps we can solve some of these problems with a little something called enforcement of existing laws. How is this project meeting the stated purpose behind the Great Streets initiative? Increased Economic Activity – is this configuration increasing business? Greater Community Engagement – we’re talking now! Improved Public Health – I don’t see more people walking or riding through this area. We need to review these objectives and get on the path toward achieving them! So you want us to feel sorry for the people who experience this when they get in/out of their cars and not recognize this is what people who are on foot or bikes face on pretty much every part of their trip? It’s “much safer” when cars weave past the bike lane to access parking? “Much safer” when bikes and cars are just separated by paint? Sorry but if you’ve been biking in the area for 32 years and believe non-separated bike lane is preferable you are thinking through a very narrow scope and not considering the reality that most people say they do not bike because bikes are rarely physically separated from cars. Let me guess, cars can’t see those invisible sidewalks with invisible pedestrians either? Turning cars need to look out for pedestrians and already needed to look out for bikes in the old set up as well. This doesn’t really change how safer drivers behave, which is proceeding with caution when preparing for a turn and looking out for bikes and pedestrians. Ohhh no! Car drivers opening their car doors closer to moving traffic? Well if it’s so safe to pedal next to fast moving cars (as you indicate by saying it’s safer for bike lanes to be sandwiched between parked cars and moving cars), how is it not safe to open a car door next to a lane of travel? After all, most streets don’t have bike lanes and that’s what you’d do on a street without bike lanes. Actually Elle, yes it is illegal to ride on the sidewalk. Bikes are considered vehicles and are allowed in bike lanes or they can also ride in the ACTUAL car lane if they so wish. They also are supposed to follow all traffic laws because they are considered vehicles. Just FYI, I ride a bike frequently and absolutely am against the new Venice set up. It is confusing and I now am forced to ride in the blind spot behind parked cars which isn’t safer. I agree, I ride quite a bit and I find the new set up confusing and inconsistent for cyclists and drivers alike. 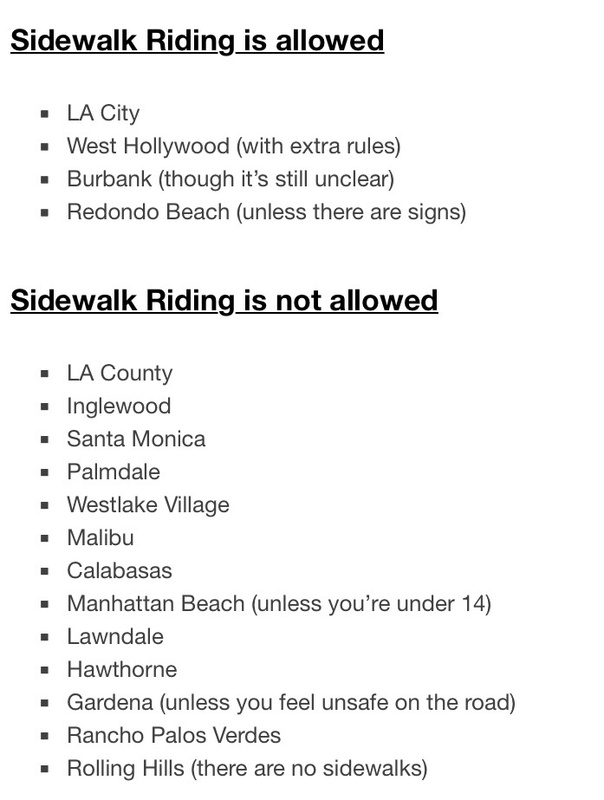 In the city of LA it is in fact legal to ride on the sidewalk. Can someone please provide a citation that shows that it is legal to ride a bicycle on the sidewalk? I have never heard that it is legal to ride a bicycle on the sidewalk. Until now. Thank you for the citation. 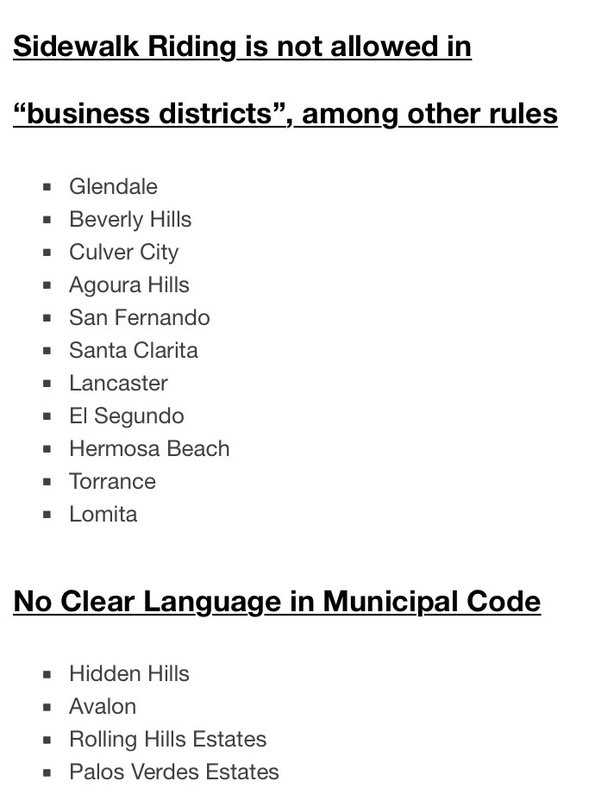 Obviously it’s very confusing that different municipalities within the same county have different sets of rules. Especially that this part of Los Angeles is so close to Culver City. It would seem to me that a bike lane is not even necessary in the first place if the bicyclist has the option of riding on the sidewalk OR in the traffic lane legally. The public would be better served by another lane of traffic. Here’s what I learned. Considering how confusing the laws about bike riding on sidewalks are, it would seem to me that a total revamp of these codes is necessary to be consistent between communities. This comment gets down to a basic question, which is what is the actual purpose of a bike lane if a bicycle is capable of riding anywhere? In Los Angeles, should bike lanes only be on roads that don’t have sidewalks? With more people be served by putting in a sidewalk than by putting in the bike lane? I live in Playa Del Rey and although I don’t agree with all the roads being turned into one lane roads, I do think there are those out there that have been less than considerate to the residents that live there. And we are not the only community that traffic is being looked at, Manhattan Beach, El Segundo and Santa Monica all have revised roadways to slow down drivers and incorporate pedestrians and cyclists. I for one would have liked to have seen speed reduction done by more lighted crosswalks, stop signs, speed limits and patrols by LAPD. I didn’t agree with the lane reduction on Culver, I thought that was silly and parts of Vista Del Mar do not need to be one lane either. But the parts that go through Playa Del Rey need to be addressed as I have personally witnessed and been subject to honking, middle fingers and some road rage from those who think of going through Playa Del Rey as a freeway. So there needs to be some compromise for those who live there and for those who commute and rather than pointing fingers and being angry at a community where most had no idea this was occurring, we need to come together and find solutions so that all can be in agreement. I appreciate the comment. I don’t know if you ride or not and if you’ve ridden down these new lanes but the main problem now is that if cars are parked in the new parking spots, cars in motion about to make a right turn cannot see cyclist on the other side of the parked cars. There was much more visibility between moving cars and bikes the old way with the bike lane. For the most part LA streets do not have painted bike lanes. So when there is a bike lane, and although it’s just a painted white line, it improves driver awareness in my experience and gives me a bit more room to maneuver should I need to take evasive action. Which is rare, thankfully. Venice is one of those streets where one of those shifting bike lanes, originally proposed for Westwood Boulevard by LACBC in response to Paul Koretz’s concern trolling, might have been better. The constrained section in Mar Vista does create a bottleneck. I’d also like to see provisions for transit, since Venice is a heavily used street for local buses. The way the stops are set up now, as a “pilot program” the buses have to wait for a longer line of cars to pass before merging in. …If this is Venice Blvd, didn’t the diet actually convert a six-lane road into a *four*-lane road? Or is there a portion I haven’t seen with only a single lane in each direction? What exactly would fall under the category of “frivolous recreation”? I’ve never heard that term before. The term is meant as a way to distinguish recreational bicyclists, who are likely to pedal much slower, perhaps riding two across and zig-zagging (as we see on the beach bike path through Dockweiler), from serious commuters on bikes, who need to get to their job/doctor/obligation. I think it is an important distinction. There is no minimum or maximum speed on bikes, and riding on a sidewalk it matters. The law states “not to endanger” or something vague, I believe, in the communities that allow bicycling on sidewalks. Well, unless we start holding car drivers to the same frivolous-use standard, I don’t think it makes sense to hold bike riders to it. My point was that people use all forms of transportation in different manners and there is government overreach to try to insist that people use only certain forms of transportation and only in certain manners. Bicyclist would help with Lucky. They can ride vehicle there early in the traffic lane, they can ride as bicycles in the bike lane, or they can ride casually with lots of stops and turns on the sidewalk. That would be great if automobiles also had three lanes to conduct their business… whether deemed serious, frivolous or recreational car trips. Sure, a bicyclist can legally ride on the sidewalk in LA, but it’s discouraged by both city officials and best practices. That said, I’ve ridden on LA sidewalks before because I prefer greater separation from car traffic than a single strip of paint can provide. And sharing lanes with LA car drivers is a non-starter for many novice potential bike riders like me. As someone who’s driven this stretch of Venice more than I’ve biked it, I’ve experienced the slower car traffic and think it’s an improvement. On the vast majority of Venice Blvd drivers speed way too damn fast and this new treatment finally forces driver to slow the F down for once. Besides, the vast majority of street width in this stretch still remains devoted to cars (4 through lanes + 2 parking lanes), so if the road diet is so egregious for car drivers then I’d encourage there to be some compromise between parking versus through lanes. Yes, because that is what the taxpayers want. Only commuters who make one or maybe two stops during a day, with no passengers who cannot bike and with no cargo that won’t fit onto a bike, can reasonably use biking as their primary mode. You can’t do what was done and have it be successful. It isn’t and won’t be. People will still drive, and they will simply take alternate routes and become a problem somewhere else. That is possible in Mar Vista, where Washington Place and Washington Blvd. are reasonable alternate routes. That is NOT possible from Manhattan Beach, the other drama zone. If you want to talk about laws requiring bike racks on Uber/Lyft, dedicated buslanes (like Indianapolis is debuting?) buses with more than racks for two bikes, and neighborhood electric (?autonomous) buses to ferry people a few blocks to the trunk line buslines, THEN YOU HAVE A REGIONAL SOLUTION. I continue to maintain that solutions like this one, which benefit the few at the expense of the many, are morally wrong. Have you looked at the cost of roads for cars vs. the cost of bikelanes per passenger mile of actual use? Which is the better value if you have? I don’t think empty bikelanes make sense. As someone who does not own a car and uses a bike irregularly, I’m most often on transit or on foot around LA. In my experience, neither car lanes nor bike lanes are empty. Well, I do commute by bike from North Hermosa to Culver City. It is 48 minutes door to door with an electric assist, going up the bike path through Manhattan Beach, El Segundo, Dockweiler, PDR, Ballona Creek. As commuting goes, the path is empty in the morning, and full of pedestrians at night. I cannot do this unless it is daylight savings time. There is still no safe way to get from Culver City to PDR at night by bike, nor from PDR to Hermosa. Even with big panniers, I cannot take office supplies on the bike. Seriously, it’s not a transportation solution for too many people without connections to buses, cargo solutions and night solutions. Doing things without constant standards and without a comprehensive roll out is benefiting a few people at the expense of many. I would be convinced otherwise by data that showed the $ per bike-passenger-mile was much less than the $ per car-passenger mile, controlling for variables like the land use offset (taking out lanes that could be used by cars) and so on. Let’s be honest. Biking is not common from the suburbs into LA. Bus ridership is down. You can’t even track your bus by GPS to be efficient! I’m in favor of comprehensive and cost effective solutions. For example a tax to enter the city during rush hour by car. Or taxing cars by number of passengers per trip, or by the physical size of the car (ie if everyone drove a Smart car, their could be many more on the road in the same physical space). Not random bike lanes that are confusing. Joe, I don’t understand how you could construe that. I absolutely support safe streets for all. In fact, if you reread my post, you’ll see my concerns. I attended last night’s Mar Vista Community Council meeting in which the public made points on both sides of the fence. Some cyclists like the change; and feel safer, while others dislike it, feeling hidden behind parked cars as I’ve described. Some don’t see the point of implementing this on a short stretch of Venice Blvd, then switching back. There was a speaker from the DOT at the meeting as well. While he explained the process, and said that they were collecting data, he did not clearly explain what data the department was collecting, nor did he cite the accident rate on this specific stretch of the road. Numerous cyclists continue to ride on the sidewalk, even with this “protected bike lane”. Those responsible for implementing this change and making the final decision should ask why. Pedestrians continue to jaywalk, even though there are mid-block pedestrian traffic signals in this area. The only way to resolve this may well be ticketing the scofflaws in order to keep them safe…. from their own unsafe behavior! Yes, I agree. I wish the 405 wasn’t so often a nightmare and then Culver/VdM wouldn’t be a pass-thru, they’d be a way for me to goto the cute restaurants. What I really don’t understand, as I was driving VdM yesterday, was how eastside of the street VdM Park doesn’t have a crosswalk connecting the west-side? I legitimately don’t know how anyone can claim to be addressing the safety issues with VdM and not put a crosswalk at the park. Isn’t jaywalking the major risk here and people will continue to cross the street here (either to access the park or parking on the east side and accessing the beach). Like… how can anyone claim these were safety changes when a crosswalk wasn’t added here? Several street safety improvements are underway in the L.A. neighborhood of Playa Del Rey. These include lane reduction road diets that have already been criticized by driving commuters who are experiencing delays. Will it be Laura Friedman, the Mar Vista Community Council, the Mid-City West Community Council, or Miguel Santiago?